Witness the power of this fully operational website . . . Flying Conquistadors will be released on March 28th, and the paperback version is already available for pre-order on Amazon, BarnesandNoble.com and through this website (click on “Buy the Book” to see your options). 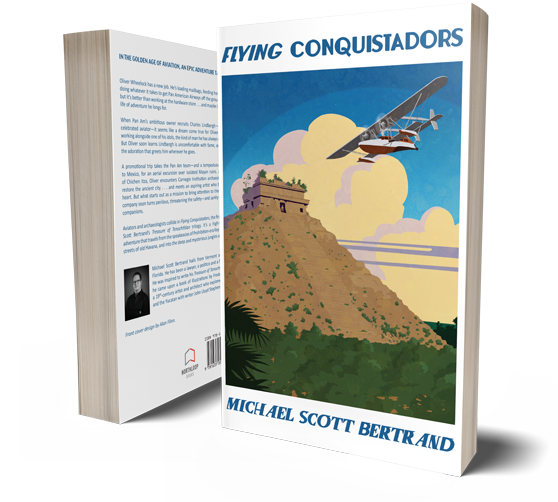 We’re making some last-minute adjustments to the electronic versions, so you’ll also be able to enjoy Flying Conquistadors on your Kindle, Nook or other electronic device. I should point out that the paperback is $2 cheaper if you buy it from me directly. $2 and one cent cheaper, to be exact! As I countdown to my first publication date, I thought I’d use this blog to let readers know a bit more about Flying Conquistadors and how it came to be. At the beginning of the book there is a note to the reader. I wanted to people to understand that this was a fictional story, a story that I made up in the dark, musty recesses my mind. But many of the fictional characters populating this story were inspired by real-life individuals, some of them famous, others not as famous as they should be. After forcing these caricatures to go through hell in service of my story, I think it is only right that I spend some time letting you know about the “real” people behind the characters in the book. I also have some great photographs and other materials focused on Pan American Airways and the Carnegie Institution, two legendary entities that are featured in the book. And lest anyone think I’m nuts for writing a story involving Pan Am and the Carnegie Institution, you should know that Charles Lindbergh did, in fact, fly Carnegie Institution archaeologists over several Mayan site in the Yucatan in a Sikorsky S-38 owned by Pan American. I”ll post some of the pictures taken on those early flights.